Ever heard of Newton’s Third Law Effect? When two objects collide, the size of the force of the first object equals the size of the force imposed on the second object. Translated into auto accident language, that law means that, in accidents involving one big semi truck and one smaller passenger vehicle, the injuries to the driver and passengers in the car are likely to be extensive. Large Truck and Bus Crash Facts is an annual report of statistics about fatal, injury, and property-damage-only crashes involving large trucks and buses. The latest complete list of statistics, covering the year 2015, showed that 4,311 large trucks and buses were involved in fatal crashes, an increase of 8% over the previous year. 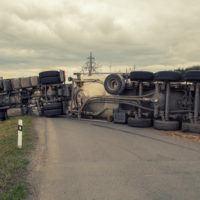 “Often, when a person is injured in a semi-truck or commercial truck accident, they mistakenly believe that the process will be just like that of a car accident injury claim, but on a bigger scale,”writes one Florida attorney.”This is simply not true”, he adds. (How well we know the truth of his words!) Put an 80,000 pound “big rig” up against a 3,000 pound passenger car, and you know that if deaths don’t result, catastrophic, life-changing injuries will. Representing people injured in trucking accidents – or the survivors of those killed in accidents – is a mission at the Ramey & Hailey personal injury law firm in Indiana. Injuries from a truck accident tend to be much more severe than those from crashes involving two passenger cars. The medical bills tend to be much higher, and months and even years of missed income can result. Meanwhile, the trucker might be employed by a large, multistate commercial trucking company or even an international conglomerate represented by a large legal team experienced in protecting the company from liability. Truck accident victims not only need legal help, they require a whole different level of help!